These are the words of Cardinal Antonio Canizares Llovera as reported by the Catholic News Agency in July 2011. As Cardinal Llovera is the prefect of the Congregation for Divine Worship and the Discipline of the Sacraments, his recommendation is deserving of our time and personal reflection. Before continuing, it is important to state something upfront. No one is disputing that receiving in the hand is permitted in those countries where permission was requested and an indult granted by the Holy See. That the practice is perfectly licit in the Ordinary Form of the Roman rite where an indult was granted is a matter of fact. 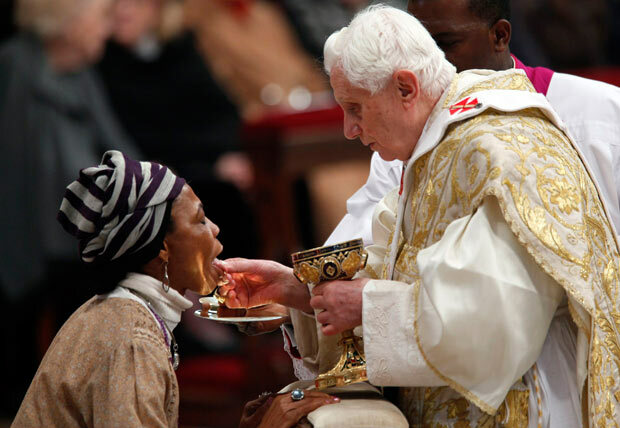 It is also accurate, however, to note that “the distribution of Communion on the hand continues to remain, from a juridical standpoint, an exception to the universal law” of receiving on the tongue according to Monsignor Guido Marini, papal Master of Ceremonies for both Pope Benedict XVI and now Pope Francis. When discussing how the faithful should best receive our Lord at Holy Communion, we should strive to see this through the eyes of our Holy Mother the Church. This does require, however, a spirit of humility and receptivity on our part. Cardinal Ratzinger further notes that the very act of kneeling is itself counter cultural. There is also an interesting disconnect which occurs for many who both understand and appreciate the posture of kneeling when in the presence of our Lord, such as during Eucharistic adoration, but do not recognize the need for this same awe and reverence when receiving our Lord at Holy Communion. “Therefore, for various reasons, among which the Angelic Doctor cites respect for the Sacrament, he writes: “. . . out of reverence towards this Sacrament, nothing touches it, but what is consecrated; hence the corporal and the chalice are consecrated, and likewise the priest’s hands, for touching this Sacrament. Hence, it is not lawful for anyone else to touch it except from necessity, for instance, if it were to fall upon the ground, or else in some other case of urgency” (Summa Theologiae, III, 82, 3). Over the centuries the Church has always characterized the moment of Holy Communion with sacredness and the greatest respect, forcing herself constantly to develop to the best of her ability external signs that would promote understanding of this great sacramental mystery….The Western Church has established kneeling as one of the signs of devotion appropriate to communicants…Kneeling indicates and promotes the adoration necessary before receiving the Eucharistic Christ. For this reason, (then) Cardinal Ratzinger maintained that “the practice of kneeling for Holy Communion has in its favor a centuries-old tradition, and it is a particularly expressive sign of adoration, completely appropriate in light of the true, real and substantial presence of Our Lord Jesus Christ under the consecrated species” [cited in the Letter “This Congregation” of the Congregation for Divine Worship and the Discipline of the Sacraments, 1 July 1, 2002]. So often those who argue for the practice of receiving communion in the hand do so by simply contending “it is permitted”. One is reminded of our Lord’s response to the Pharisees in St. Matthew’s gospel when questioned regarding divorce. They said to him, “Then why did Moses command that the man give the woman a bill of divorce and dismiss (her)?” He said to them, “Because of the hardness of your hearts Moses allowed you to divorce your wives, but from the beginning it was not so.” (Mt 19:7-8). Many today cling to a form of legalism when arguing that they are “permitted” to receive in the hand. As we have seen already, has not the Church clearly instructed us upon the best means and the universal norm for humbly and reverently receiving our Lord at Holy Communion? The Church in the Roman rite universally administered Communion to the faithful on the tongue and kneeling for well over a millennium, beginning sometime between the 6th and 9th centuries. Indults to receive in the hand only began in the 1970’s, less than 40 years ago. The majority of eastern rite churches, who primarily distribute Holy Communion via intinction, have never permitted the faithful to receive in the hand. The Extraordinary Form of the Mass in the Roman rite does not permit the faithful to receive in the hand. Rome has continuously instructed the faithful on the merit and universality of the traditional practice for as long as the indults have been in place. Finally, the faithful need not wait for the indults to be lifted in order to recapture this venerable practice. The Church has given her children ample instruction on this matter. The popes have given us extensive catechesis on this subject, most particularly by their personal example at Holy Mass. Our Holy clergy need not wait either. There are parishes today which are reinstalling altar rails in order to recapture this venerable practice. Others are simply bringing in kneelers for the faithful to use during Holy Communion at Mass in order to recover this posture of adoration. Posted on November 25, 2013, in liturgy and tagged cardinal llovera, communion in the hand, communion on the tongue, congregation for divine worship, holy communion, kneeling for communion, papal masses, redemptionis sacramentum, spirit of the liturgy. Bookmark the permalink. 4 Comments. I couldn’t agree more! The timing of this post coincides nicely with my confirmation class yesterday (Sunday). We are discussing the parts of the mass and had a large discussion in reverence. Why we bow to the altar, genuflecting, etc… If you don’t mind I would like to share your post with my class. It ties in perfectly! Thank you for the kind words Steven. You can absolutely share any post from the blog with your catechism class. God bless you, Kristen and the kiddies! Well researched and presented, Brian. The Church would do well to have more bishops and priests who possess the intensity of devotion and piety that you describe herein. God bless! Thank you for your thoughtful comment, as well as your wonderful blog!